Can States That Legalize The Use Of Cannabis Have An Advantage? “Yes” seems to be conclusion of a new study published this week. Isn’t this speculative though? Well, of course it is. To some extent. Obviously, we won’t be able to determine if early adopter states have an advantage until we dust off the cobwebs of the federal prohibition legislation, then promptly dispose of it like bad meat. But America – the land of the free – is no stranger to prohibition. And if we are to echo the end of alcohol prohibition, the early adopter states may well have a long-term advantage over late adopters. Remember back in 1933 when alcohol prohibition was lifted? If so, you’re an anomaly. But in a good way. Either way, it happened. Yes, it was apparent to the majority of Americans that the 18th Amendment was foolish and needed to go away. That’s the beautiful thing about amendments. They can be amended. At any rate, some states were much quicker to getting on the wagon to fall off the wagon. And researchers took a look at how these early adopters fared – both in the short-term and in the long-run. Seems the breweries in those early adopter states took the medals in both events. Meanwhile, there were 463 breweries in states who opted a year to wait on legalization. They survived an average of about 5 years and half had closed by 1935. What Does This Mean for Early Marijuana Legalization? The researchers believe this is a harbinger of what we can expect to see with the marijuana legalization movement too. In the long run, states that legalize in the earliest stages of this staggered removal of the drug’s prohibition may enjoy an early-adopter advantage with respect to the production and sale of marijuana as they gain a foothold in what may soon become a national (or international) market for the product. And they feel that this research is worthy of discussion. But it’s true. Tourism alone has given Colorado businesses a serious boost. And that’s likely to have long term effects. Because folks come for the weed, but stay for the awesome restaurants/venues/stores/galleries/etc. And then they keep coming back. An increasing number states are motivated to legalize due, in part, to their proximity to states that have already done so. 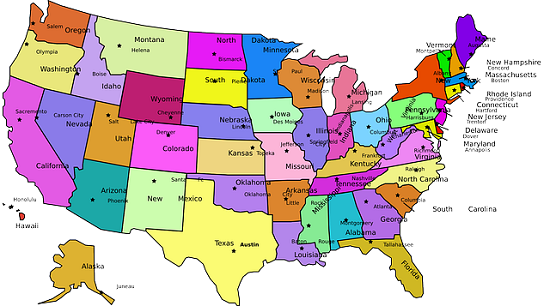 Especially in areas where there are more and smaller states packed together, such as in the Northeast. It’s pretty clear that early adopter states have advantages that others don’t. And one of those advantages includes access to marketing experts who are geared toward the cannabis industry. If you want to talk straight and effective marketing for your cannabis business, reach out to us. We understand the unique characteristics of this industry and know how you can use them effectively to your advantage.